I have been avidly following several blogs for the past few months and have toyed with the idea of starting my own blog. However, starting a blog brings about a very important question, what would I write about? I originally started to think about blogging as a way to 'give back' to those whose blogs I read. It sounds kind of silly but I felt like I was just taking from the blog world and not giving anything in return. Many of the blogs I read are either craft/sewing blogs, food blogs, or fashion blogs. I love crafting but I don't accomplish projects enough to actually make a blog and I don't have money for fashion. I do love cooking but I don't know if I could stay on task with a cooking blog. That leaves me with a personal blog as my last blogging option. I tried to have a personal blog at the end of highschool/beginning of college (back when xanga was the 'it' site) where I wrote what ever I felt like and it turned into a place to vent. And really, who wants to read about my bad days? Who even really wants to read about any day unless it has some sort of point? This blog needs a thesis statement to keep me within a rough sort of boundary in order to prevent this blog from devolving into a rambling mess (darn entropy). After evaluating what over arching elements I enjoy most from the blogs I read, I have discovered that as a general rule, all of the blogs focus on the good in life, the blessings that God has given us every day even if it is as small as actually eating breakfast. 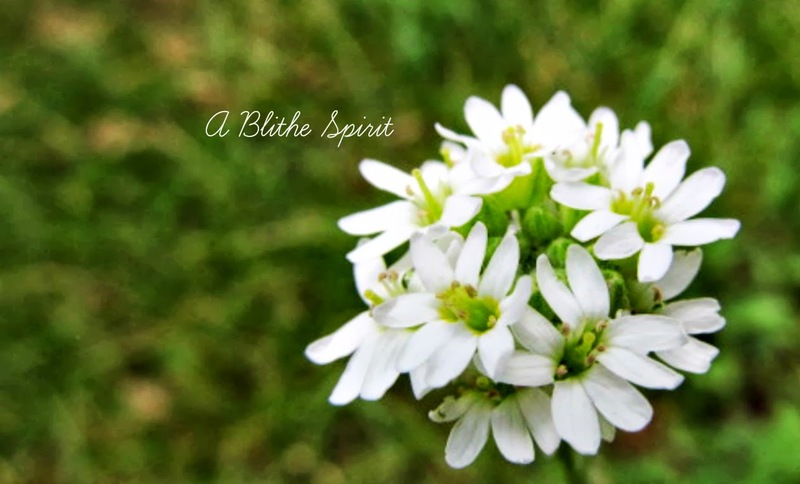 So my thesis statement for this blog is: A Blithe Spirit exists to purposefully find the blessings God gives in daily life. I know that I don't stop often enough and really focus on what God has given me. I tend to worry and fret and remember all of the blah stuff from the day. Here I plan to praise God by thanking Him for his many blessings. Some days those blessings may be in the form of pictures, other days it may be a 'how-to' post, and other days it may just be musing on my blessings. Regardless of the form, I want this blog to be an uplifting and authentic representation of my blessed life. I hope that if anyone reads my words that they will come away with a renewed desire to see the blessings in their own lives and to give God praise for His many gifts. You have a great thesis! It will be fun and uplifting to read. Sounds like you have a great start. I've found a couple things to be very helpful, following SITS, which has introduced me to fabulous blogs and bloggers while giving me tools to become a better blogger, such as this link: http://www.chrisbrogan.com/best-of/ Theres a bunch of very helpful articles there. Just take it at your own pace though...it's easy to get overwhelmed! Gasp! I am taking my playlist off my sight right now! On another note, I like your thesis and your blog very, very much.